You can also browse the full shows schedule and, if you’re lucky enough to live in the UK, enter to win tickets from within the app. My daughter and I got our first exposure to Adele a couple of years ago in the iTunes Festival app – we were huge fans right away and we still are. This year’s lineup at the festival includes The Lumineers, Lady Gaga, Queens of the Stone Age, Paramore, Arctic Monkeys, Kings of Leon, John Legend, Justin Timberlake, and lots more top acts. That’s Eliza Doolittle, and I just love her voice – and love how this app and the iTunes Festival have always lead me to discover new music I enjoy. 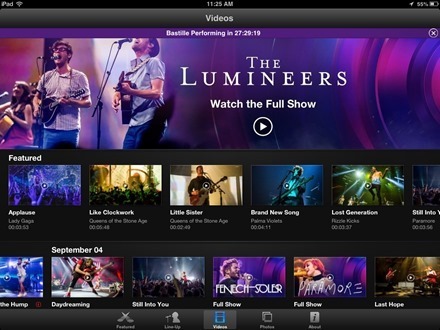 Here’s an App Store link for iTunes Festival London 2013. I can’t figure out how to find the iTunes app for this. Where can I find it? I looked on iTunes and didn’t see anything.